Set among mature Valley Oaks on the south bank of the Tuolumne River, River Ranch is a unique neighborhood with a timeless charm. The exposed flagstone pillars at its entrances introduce the character of a neighborhood that features curbside greenbelts and expansive lots. Complemented by these distinctive surroundings, the homes at River Ranch emphasize traditional lines, steep-sloped roofs, and exposed stonework, offering a style and elegance reminiscent of colonial New England. While each of our plans offers an amazing array of standard upgrades – such as standard 3-car garages, vaulted ceilings, gourmet kitchens featuring solid granite countertops and tile floors, hardwood cabinetry – the flexibility of our designs gives you unlimited options to customize your home. 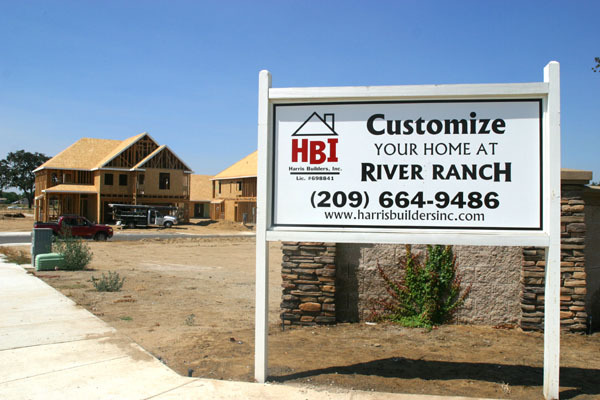 Feel free to browse our plans and elevations, and then contact our sales office to begin customizing your new home at River Ranch.